Happy New Year everyone. Did you all have a fabulous Christmas? Was Santa good to you? Santa was very good to me! I got a beautiful necklace from Jaime and a gorgeous Mikasa wine set from Paige. I got a few other things for the house. The best part of Christmas for me is spending it with my family. I have a picture with Paige (that is super rare), Antonio, Celeste, Grace (my niece) and Sean (my nephew): I also have a picture of Yvette (Celeste's mom) with Celeste and Cataleya. Santa was super nice to Celeste and Antonio. Celeste left my parents house with a SACK of toys....and had so much fun opening presents, he did not know what to do with himself. Here he is in his toy train set on Christmas eve at my parent's house, and then on Christmas morning with his Cowboy hat and Gun (he just needed some boots to be complete). One of his favorite gifts was a Thomas the Tank Train Roller Coaster ensemble. I am going to attach a 6 second video, but in case you cannot see it, I put a chronological ordered photo shoot after the video that I think will give you the idea of how it works and how big that smile is when he is done. Now, as for knitting (since this kind of is a knitting blog)......I finished my socks in the nick of time (12:09 am Christmas Morning) for the Hiya Hiya Sock KAL. Paige snagged them and loves them. I also finished Bizzles pom pom blanket and was able to put hers and Paige's under the tree to them...they both loved them! I also went on ravelry and made some 2014 goals for myself. This is the first year I have set goals like this so I hope I am able to get at least 1/2 done. I also want to be on a semi yarn diet. The yarn clubs should be good enough for my stash enhancement. We will see about camp loopy! Keep up with Yarn Clubs. I joined 2 yarn clubs this year. Strickmich Yarn Club and Miss Babs Knitting Tour. I know that I may not ‘fall in love’ with each and every pattern or yarn sent to me, but I want to try to keep up with the yarn clubs as best as I can. Knit Swirl (or at least knit a substantial amount of it). Selfish knitting. I want to make at least one more nuvem before next winter. I also want to knit a color affection….I have wanted to knit one since the pattern was released, but again….work keeps getting in the way. Maybe for the camp loopy highest yardage project (because we all know I will be doing camp loopy….I may just need to do it with stash this year…we will see). 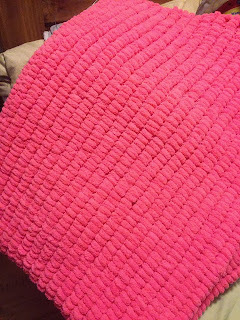 Make a Brickless with Biker Chick Yarn from Miss Babs. Keep up with some more sock KALs. I am now a moderator of the Hiya Hiya Free & Fun KAL group and I would like to be a more active participant but I cannot knit socks that fast and all the other moderators seem to be able to knit socks in 4-6 days...but I will try to be more active! Oh yeah….and just as a challenge, I hope by completing some of the above goals, that I meet one more goal…..to knit more miles in 2014 than I did in 2013 (8.13 so far, but need to add the sweater for Paige to that). In my last post I said that on the 26th we (me and the gals I knit with) were going to cast on the Suzi Shawl....and we did. Here it is so far. I have a gram count so I can have it finished by the end of January (with me luck). Lastly, I want to take a good look at any other WIPS I may have and if I am never going to finish it, then I just need to frog it....or rippit! My annual SNB Christmas party is tomorrow and I hope it is a success........That is all for now. You guys have a great week and a Happy Happy Happy New Year....and as always, Happy Happy knitting!!! Merry Christmas everyone! Are you done with all your shopping? I am not...I need to sit down and get organized and make a list of what I have and what I still need to get....YIKES! I have been working on Paige's sweater and the body is done....I have been working on sleeves, then I just have the collar, pockets and belt....so close, but yet so far! This week had a couple of surprises in it for me. I participated in a Secret Santa exchange with my online knitting group. I mailed my package to my recipient on the 5th of December...more on that later. I got my package from my secret santa and it was super awesome! I got a book on Yarn Farming, a gorgeous hand sewn project bag in my favorite color (orange) and a super soft skein of Madeline tosh yarn! I love it all! As I stated, I mailed my package on the 5th of December with a scheduled delivery date of December 9th. Well, on the 16th, when the package still was not delivered and I still had not heard from the post office (I opened a case number on the 11th) I decided to get together a second package....it was not quite as personable as the first one because I did not have enough time...but I do hope she still likes it. I mailed it on the 17th and it should be out for delivery today. Then guess what happened.....On the 17th, the tracking item of the first package was finally updated.....the package was in Illinois? It was sent from Texas to Texas so how it got to Illinois I have no clue......hopefully my secret santa recipient ends up getting both packages....she deserves it for being so patient and waiting so long! I added to my stash this week.....I got some Miss Babs Coffee Break Yarn.....I could not help it. Every since it went up on the website, I have been eyeing it like crazy! When I ordered the Knitting Tour I told you about last week, I broke down and ordered this yarn too. See, a lady at my work that knits with me at lunch made this shawl pattern. The shawl really did not catch my eye that much......but after she made it, I fell in love with it. The pattern originally calls to work it in two colors...she just used a variegated light neutral colors and it looked awesome.....soooooo....I am planning on making the same shawl in this coffee break color (We are calling it the Suzi Shawl since Suzi already knit it) ....look at these skeins and cakes....GORGEOUS! I have also been working on my sock for a HiyaHiya KAL. I told you guys that I was a hostess for a KAL and I did not know it when I signed up to be a hostess or till about 2 weeks into hostessing the KAL that you get a hostess gift. Well, my hostess gift has not arrived yet...but the lady who runs the Hiya Hiya group (her name is Qianer) is so generous that she sent me a Christmas gift! Can you believe it? I LOVE IT...it is a magic loop needle set for socks. So it has each of the sock size needles in 40" cables in the prettiest case ever. Thank you Qianer and thank you Hiya Hiya!!!!! They are always having KAL's for socks and they have some awesome prizes if you ever want to join us!!!!! Lastly I leave you with a picture of a tape measure loving grandson and my wish list for Santa.....I hope you all have a very Merry Merry Christmas!!!! 10 days of doing the same thing can be good and bad. 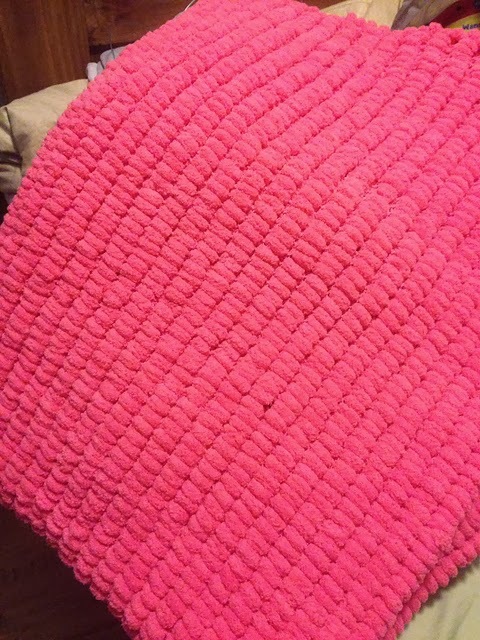 10 days of knitting....good! 10 days of moving....not so much! Okay, so I did not actually move for 10 days straight, but I am still moving stuff and it was about 10 days ago that I posted about the move. Here is some of the stuff I have to go through in my room and in the garage....and also, the living room is starting to come together....but I keep adding more 'crap' to it. The living room actually looks completely different since my daughter has put up the christmas tree. Speaking of my daughter, Paige, she wore a hat I knit her over a year ago......the weather has been cold enough for her to use this hat. I also finished knitting a pom pom blanket for her as a surprise present for Christmas (no, her sweater is not done yet...but the blanket it). I also had my gift exchange with my knitting bff, Darlene....she got me the most awesome gifts ever! The Loopy Ewe has these fall giftables that has a special and exclusive hand dyed yarn and she got me the October kit that came with a skein of Wollmeise in Confidence! It is gorgeous! It came with a pattern and I cannot wait to cast on!! She also got me one of the exclusive sets from Little Skein. This kit came with a skein of yarn, a project bag, a pattern, and set of stitch markers.....the stitch markers (and yarn) match the project bag.......YUP! It is so perfectly cute! I cannot wait to make a pair of socks with this awesome yarn. While I absolutely love all the yarn and knitting paraphernalia, the best part was the card.....it says "A good friend will tell you when you're being silly. A great friend will join you." Darlene is a GREAT friend! Thank you Darlene! These last 10 days have flown by.....it seems like every day I am just either packing and moving more stuff or I am unpacking and putting things where I think they need to go......I did manage to order one more yarn club. This is the Miss Babs Knitting Tour 2014. It is very similar to the Strickmich Club I just joined, but this is the 3rd year (I think) that she is doing this....I really wanted to do it last year, but I just could not swing it financially....so this year I knew I had to do this club. Thankfully each club mails in different months, so for 8 out of 12 months next year.....I should be getting a package of fun! How was everyone's Thanksgiving? I had a great Thanksgiving with family, but the days before and after were crazy pants! I have not posted in 2 weeks and I am very sorry. Last week was a short week at work for me. I was off Wednesday, Thursday (Turkey day of course) and Friday....then my regular Saturday and Sunday off and I was in chaos for 5 days. Did I knit a lot you ask? How many projects did I finish you ask? The answer is a big fat NONE! So....what was I doing you ask? Moving! and it STINKS! I worked harder these last 5 days than I have worked in my last 5 years! No joke! I wish I had lots of pictures to show you, but the truth is that I was just too exhausted to remember to even take pictures. I hurt my foot sometime Saturday (the movers were doing the heavy furniture moving on Saturday). I have no clue what I did and I do not know why it is just my left foot and not both feet.....but my left foot is super swollen and very hard to walk on. I took this picture late Saturday (I think, it is all kind of a blur), and I think the swelling got a little worse, then I put ice on it and it has stayed the same. In the midst of moving craziness, I did ask my BF, Darlene, to text me at certain times so I could sign up for a yarn club. My favorite designer, Martina Behm, is doing a yarn club for 2014. It is a little pricey, but she is my favorite designer and I knew if I did not sign up, I would regret it later. Jaime said he wanted to get me this yarn club as a Christmas Present.....he is so awesome! Anyway, Darlene texted me at all the right times and I was able to get a membership (here if you are interested). I am super excited and I cannot wait for February to get here for the first shipment. Prior to the moving craziness....I had a bit of a scare from my daughter. I get this text out of the blue from her that says "Mom thank god I'm okay". So I am thinking to myself, "Holy cow she has been an a car accident!" (this just after I have a long talk with her that the insurance is going up because of all her fender benders). I call her right away and send texts at the same time to see what happened. Turns out a car drove into her school....seriously. A suburban was in the middle of the school and thankfully my daughter is fine and was on the other side of the school doing a hair cut. You can read about it here. Oh, and some really great news is that I did not need to move Tito with us to the 'new' house (it's not really new, but if I call it the old house then it gets too confusing). Paige's friend took him and things are much calmer in the dog area than before. I do miss him (sometimes), but I am glad he found a good home as I just could not give him the patience and attention he deserved. So my blog is a little here and there today but that kind of matches how I have been the past few days....disorder and lack of organization....but we did end up sleeping at the 'new' house Saturday night. Antonio's dad watched him from Thursday to Saturday evening so we could get as much moving done as possible (it was a great help). Paige's TV in her room is not working yet, so she and Antonio came to my room and we decided to have breakfast in bed (Paige went to Chachos as we do not have a working stove or microwave yet)....here is my handsome grandson having breakfast in my bed....and then later after he found my q-tips (Don't worry, I made him take them right out after I snapped the picture as I did not want him walking around with anything sticking out of his ears). Lastly, I leave you with a picture for all my OCD friends....I have OKD.....and I think I have a few friends that have both of these disorders! Ha, Ha!! !